The Heinkel He 113 was a fictitious German fighter aircraft of World War II, invented as a propaganda and possibly disinformation exercise. In 1940, Nazi Minister of Propaganda Joseph Goebbels publicised the fact that a new fighter was entering service with the Luftwaffe. The plan involved taking pictures of Heinkel He 100 D-1s at different air bases around Germany, each time sporting a new paint job for various fictional fighter groups. The pictures were then published in the press with the He 113 name, sometimes billed as night fighters (even though they did not even have a landing light). The aircraft also appeared in a series of "action shot" photographs in various magazines such as Der Adler, including claims that it had proven itself in combat in Denmark and Norway. One source claims that the aircraft were on loan to the one Luftwaffe Staffel in Norway for a time, but this might be a case of the same misinformation working many years later. It is unclear even today exactly who this effort was intended to impress—foreign air forces or Germany's public—but it seems to have been a successful deception. 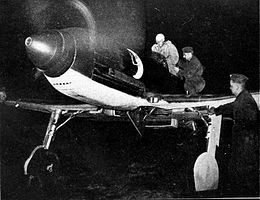 British intelligence featured the aircraft in AIR 40/237, a report on the Luftwaffe that was completed in 1940. There the top speed was listed as 628 km/h (390 mph). It also states the wing was 15.5 m² (167 ft²) and it noted that the aircraft was in production. Reports of 113s encountered and shot down were listed throughout the early years of the war. ^ Green, William; Gordon Swanborough (1997). The Complete Book of Fighters. London: Salamander Books Limited. ISBN 1-85833-777-1. Darbrowski, Hans-Peter (1991). Heinkel He 100 : world record and propaganda aircraft. West Chester, PA: Schiffer. ISBN 0-88740-345-X. Donald, general editor, David (1997). The encyclopedia of world aircraft (Updated ed.). Leicester: Blitz Editions. ISBN 185605375X. Green, William (1963). "Heinkel's Hoaxer". RAF Flying Review. Heinkel, Ernst (1956). Stormy Life Memoirs of a Pioneer of the Air. Boston, Mass. : E. P. Dutton & Co. Inc.
Heinkel, Ernst (1955). Stürmisches Leben Herausgegeben von Jürgen (in German). Stuttgart-Zürich-Salzburg: Stuttgart-Zürich-Salzburg, Europäischer Buchklub. Wagner, Ray; Nowarra, Heinz (1971). German Combat Planes: A Comprehensive Survey and History of the Development of German Military Aircraft from 1914 to 1945. New York: Doubleday. Wikimedia Commons has media related to Heinkel He 113. This page was last edited on 26 May 2017, at 06:22 (UTC).